BARACK Obama at Wilbur’s Chocolate in Lititz, Pennsylvania. PRESIDENTIAL trail life is a study in the embrace of absurdity. To accept the game is to get used to a cast-iron stomach as a way of (possibly shortened) life. Some candidates dig it. President Clinton wolfed almost anything down with gusto. But Barack Obama is a more fastidious, not to mention fit, fellow. 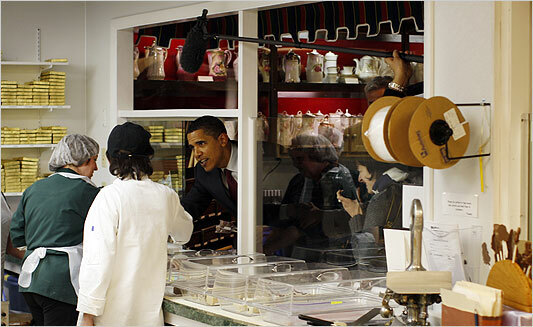 So on a misty Monday afternoon, Barack Obama, presidential candidate, marches into Wilbur Chocolate in search of nothing more than a little television attention. For reasons known only to the cultural/culinary/olfactory history of eastern Pennsylvania, the town of Lititz has been the site since the 1930s of a place – Wilbur’s Chocolate – thick with the nostril-widening smell of chocolate in all its many manifestations. It is a place of chocolate covered pretzels, giant jellies, two foot long milk chocolate bars, anise bears, Rip Van Winkle Opera fudge, chocolate marshmallows and so on and oh so sweet. Mr. Obama’s head swivels. Say huh? You need a lapel pin, the mayor explains. This seems a promising bit of weirdness – a statement perhaps on patriotism. But, alas, the Republican mayor offered the candidate only a lapel pin for the town of Lititz. He walks through the chocolate factory to Chocolate Walk, where five plump white-haired ladies in plastic hair-nets spin chocolate into hallucinogenic shapes. So we have a white chocolate phantom of the opera mask and pink high heels fashioned of chocolate. The candidate moves behind the counter at the factory end to talk with those five older ladies. They giggle; what a silly existential presidential candidate. “We make it; of course we eat it,” says Jean, who had a German last name that just one of her co-workers could pronounce and none of the “girls” could spell. The candidate pauses for a photo with his “sweet girls” and then continues his culinary odyssey in downtown Reading, where Mr. Obama wanders into the Marvel Ranch diner. Said diner was already closed after lunch, so in truth a few extras, Obamaistas all, filled the place out. Question to our Keystone State readers: What is it with this Pennsylvania fetish for bizarre world food combinations? In Johnstown, this New Yorker encountered the artery-clogging prospect of cheese-fries. And here in this diner in a perfectly lovely corner of this Berks County we come upon the Marvel Mess, a sandwich combining eggs, potatoes, onions, cheese, green peppers and Shiva only knows what else. (And in Philadelphia, my college son Nick tells me they serve up a sandwich called the Roethlisberger, named after the Pittsburgh Steelers quarterback, which sound so utterly and purely disgusting in its bouillabaisse combination of mystery meats and cheeses and coarse spices, as to induce a stomach-throbbing ache just hearing of it). Cheryl Burton offers the candidate a thick chocolate cake with white chocolate frosting. He looked at this thing, clearly a little worried; it’s only been 45 minutes since he was asked to inhale three varieties of chocolate. He turns around to find a beaming waitress offering him a plastic container. Our trim candidate sighs and opens it up. There’s a burger oozing fat, those cheese fries, and brown onion rings. He shrugs, takes a ring and tosses it back. Score one for the cholesterol lovers. ← Bam’s blue collars in Penn.